Inspired by the tight curls in depictions of the Buddha at Java’s Borobudur Temple, jewelry artisan Zayd Makarim creates these intricate half-hoop earrings by using the lost-wax technique. 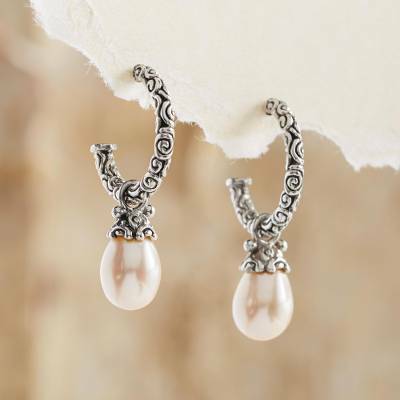 Pale blush cultured pearls are suspended from the ornate hoops. You can find cultured pearl dangle earrings 'Blushing Rose' by Zayd Makarim in jewelry categories such as Bridal Earrings, Birthstone Earrings, Nat Geo Gifts Earrings, Pearl Earrings, Silver Earrings, Sterling Silver Earrings and Half Hoop Earrings. Enjoy exploring these sections for other Novica treasures. Zayd Makarim has received 9 microcredit loans with 0% interest from Kiva and Novica, the first for $2850 and the most recent for $7500. Proceeds were used to buy natural gemstones and silver to use to make jewelery. Like this so much. Worth of quality. Beautiful jewelry. Good quality. Wife loved them. The artwork on the hoops is just beautiful and the pearls are gorgeous. You can dress them up or you can dress them down. They will be my set of go-to earrings! These earrings are just as beautiful as the picture. I love them!